Desert Equine Balance: Winter Salt - and avoiding dehydration. Hi Patti - I was wondering about adding extra salt if the horse has had a history of ulcers or stomach discomfort? Does salt tend to irritate the guts? No - the added salt won’t hurt the gut if it is mixed in with the feed. Horses who become used to free choice salt will make frequent use of it on their own - they wouldn’t do that if it bothered them. I give my horses around 3 oz/day in their feed (beet pulp + Timothy pellets + minerals and flax) - it is a bit more than they need for sodium but it’s currently their primary source of iodine at the moment. 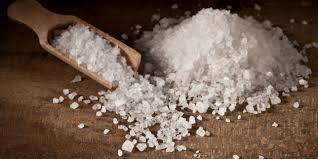 An ounce of salt in the winter for an average (900-1000lb) horse that isn’t working hard is a good insurance level as long as they are getting 4+ mg of iodine from their supplement or something like Source. When salt (and other electrolytes) can be a problem and possibly contribute to ulcers is when they are bolused or syringed in - they way endurance riders often do - and not diluted well by the horse eating and drinking. In this case, salt is a minor issue but potassium can be very irritating. And if a horse is already dehydrated, it’s best to slowly add salt in feed that also supplies water - like sloppy beet pulp mash.